THE confluence of two quite different vocal traditions produced a concert of exceptional beauty in the austere surroundings of the Wesley Church in Barton. The Song Company, singers very much in the western style of harmony and polyphony, were joined by Palestinian singer Oday Al Khatib from a contrasting tradition of modal melody and rhythm. It has been a few years since I last heard The Song Company and in that time the artistic direction has transferred from Roland Peelman to Antony Pitts and most of the singers have changed over as well. 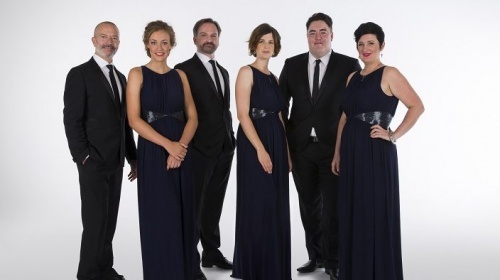 Their skills as a small vocal ensemble have been in no way diminished and if this concert is representative perhaps enhanced in the presentation of early sacred music. The concert was a mix of renaissance and baroque church music by Henry Purcell, Thomas Tallis and Gregorio Allegri interspersed with songs in Arabic by Oday al Khatib. There was a brief spoken introduction by Antony Pitts, where it was suggested that applause could wait until the end of the concert and the music started. The opening Purcell motet was sung with the choir off to the side in the choir stalls, out of sight of the audience in the nave. They moved to the stage for another short work by Tallis followed by Al Khatib entering from the back singing solo. Simple but effective theatrics and superb singing. The two major western works were Tallis’ The Lamentations of Jeremiah and the well known Miserere by Allegri. The Lamentations were split into two, separated by two Palestinian songs and a total joy to hear. The Miserere was performed in what they describe as a more “authentic” version with one voice per part and at the correct pitch. The famous soprano line in the response sections seemed almost impossibly high and improved with each repetition. Al Khatib’s contributions were a mix of solo songs and some with vocal backing from the Song Company. This posed some problems as Arabic music is essentially melodic and not given to harmonised backings. In the most part, it was done tastefully and sympathetically, though occasionally veering into sounding like a 1960s “Swingle Singers Go Arabic” LP. Still, it did not distract from the glories of Oday Al Khatib’s voice. He is one of those singers who you feel simply privileged to have heard and a concert that will linger in the memory.